WHERE TO EAT, SLEEP, AND HANGOUT DURING SALONE DEL MOBILE 2016. Milan distinguishes itself by an obsession with the avant-garde. At times, the past can seem inescapable—or even somewhat stifling—in other Italian cities, crowded as they are with medieval stone and landmarks. Not so in Europe’s fifth-largest city, birthplace of the “new new” for so much of our fashion, design, and taste. Say what you will about New York Fashion Week or Art Basel Miami Beach, no event takes over its host city as much as the Salone del Mobile design and furniture fair. It’s not just the parties (though there are those); it’s more the ethos that good design should confront you everywhere you turn. As such, the simple experience of walking into a store, café, or even a restaurant can feel like touring a museum personally curated for you. Why not stray off the beaten path this year? The week rewards a wandering gaze. The first Salone Internazionale del Mobile di Milano was held in 1961, and has grown from its humble furniture trade show origins to the tent-pole event of Milan Design Week, drawing over 310,000 visitors last year. This year’s edition will feature roughly 2,300 exhibitors, from a vast array of countries and disciplines, across 207,000 square meters of net exhibition space. (If you’re there to ogle the lifestyles of the rich and famous, however, this year’s newly added xLux section will feature offerings from Roberto Cavalli, Versace, and even Aston Martin.) Be sure to stop by the Salone Satellite, which has become an important way for younger designers to debut experimental work. This one’s a can’t-miss: The Triennale art and design museum in the Palazzo dell’Arte will once again stage an exhibition to coincide with Design Week—the first such invitational in 20 years, now in its 21st edition. The theme, “21st Century. Design After Design,” examines what design means in a world where society lives, increasingly, somewhere beyond the boundaries of the physical world and no longer sees change and evolution in design as a necessity. Beyond being high quality, the show is simply important, posing the question to thinkers in the disciplines of art, design, and technology. It’s spread across seven venues— La Triennale di Milano, Fabbrica del Vapore, Hangar Bicocca, Museo delle Culture, the Politecnico University, IULM University, and Villa Reale di Monza—each with its own curator. Ventura Projects stages groundbreaking contemporary design exhibitions around the world and during design week puts its best face forward for Ventura Lambrate, its flagship event, which takes over the northeast Lambrate district of the city. This year, more than 600 applicants clamored for the seventh edition’s 160 exhibitor slots. The show will see the return of a host of designers that gained notoriety at previous iterations, like Lensvelt, which showed a giant cannon for Ventura Lambrate in 2012, or 2013 participant Robert Bronwasser, who this year will design a home around its furniture. Ventura Lambrate prides itself on organizing its edgy designers around certain themes and this year’s are impressive: Among them is “Mad Men,” which questions masculinity in design. Should you be looking for a more ’80s vibe, there’s also “Memphism,” a presentation of designs inspired by the Memphis Group. Things kick off a little earlier drinking-wise in Milan, and the after-work aperitivo happy hour is an important social staple. While food is rarely offered at clubs in New York (and its previous consumption feels vaguely shameful once you’ve entered), Bobino’s aperitivo buffet draws crowds to its hefty leather sofas. Indeed, as a nightclub, Bobino feels uniquely Milanese. Nestled in the Porta Genova neighborhood, the soccer matches aren’t always taken off the big screen just because there’s live music. Like all hip venues at the moment, the music relies heavily on deep cuts from the ’80s and ’90s, but there are also impressive DJ sets each of the four nights a week it’s open. 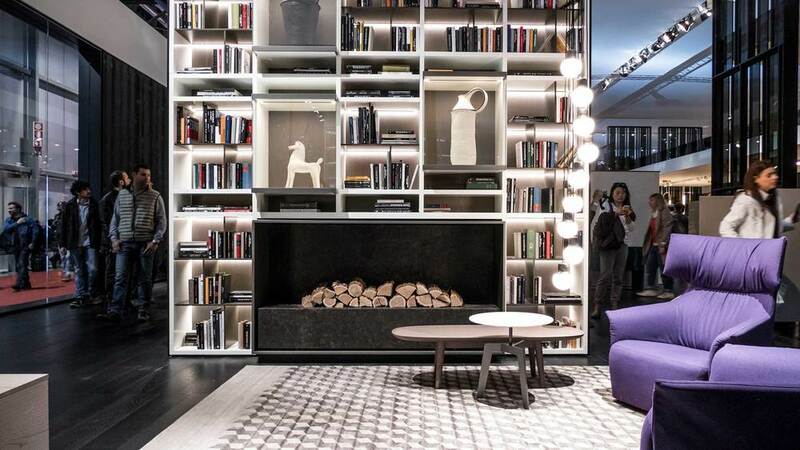 No matter when you go, its 65,000 square feet are sure to be filled with eclectic entertainment, the variety of which can only be found in Milan. If you want to feel like you’re in a Fellini movie, schedule your next meeting at Bar Basso. A traditional meeting place for creative types, this bar is as iconic as it gets. Basso opened in 1947 and doesn’t feel like it’s changed much since then, with its dark wooden accents, low chandeliers, and tie-wearing shirt-sleeved bartenders. The thing to order is their Negroni Sbagliato, or “incorrect Negroni.” The traditional Negroni is, of course, 1:1:1 Campari, Italian vermouth, and gin. Legend has it, one of those same dapper bartenders, some 50 years ago, accidentally grabbed spumante instead of gin, and thus the Sbagliato was born. Basso’s version is naturally lighter, a crowd pleaser on warmer nights when the heavy throng at the bar has to spill out onto the street. There’s nothing more satisfying than when a space’s clientele rises to meet its architecture. This is certainly the case with Ceresio 7, where the local firm Dimore Studio oversaw the renovation for this restaurant, which occupies the top floors of this 1940s Art Nouveau office building, the historic palazzo ENEL and home to fashion house Dsquared2. Dimore drew on a diverse source of influences: Art Deco for the downstairs, using traditional materials and vintage flairs, with a Phillip Johnson vibe for the pools on the roof, complete with Donald Judd-like cabanas. (Yes, the people who furnish this landscape are well upholstered, and there are worse ways to spend the afternoon than poolside with the cocktails here.) The aperitivos are recommended, but if you’re in the mood for traditional Italian, this may be your spot: It does a contemporary take that will keep you surprised without bloating. Get something with squid ink. This former sawmill draws crowds from the art and fashion sectors, and it’s worth a trip if only to gawk. (Brands tend to take over the space during Salone for private dinners, so be sure to call ahead.) 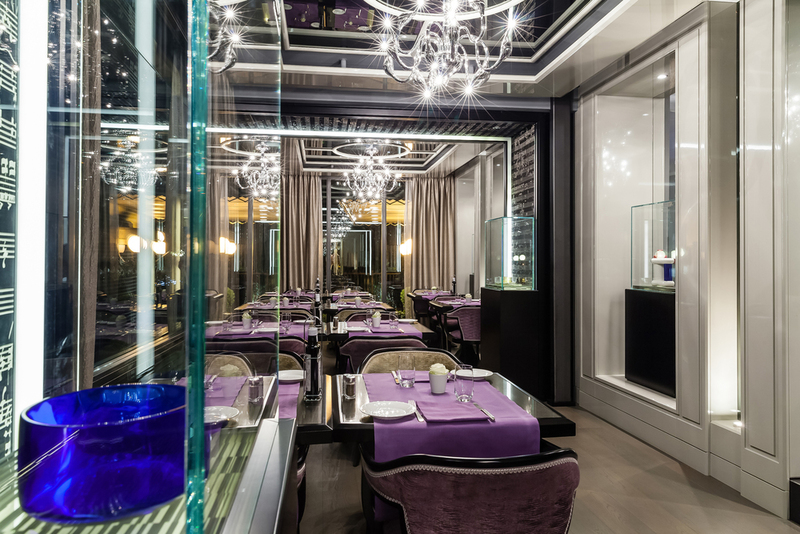 The restaurant is the brainchild of designer Tanja Solci and chef Carlo Cracco. Its scraped bare concrete clashes delightfully with the giant vintage cut-crystal chandeliers. Rounding out the image is dinnerware by Richard Ginori and modern dining chairs from Cappellini. Cracco, the host of MasterChef Italia, switches up the menu every 45 days, so you just might have to make multiple trips. The Mandarin Oriental only opened last year, but it’s already made a splash in the Brera district and nearby shopping hub Via Montenapoleone. Like all hotels in the collection, the property seamlessly integrates its oriental style with the locale— in this case, four 18th-century buildings renovated and sleekly updated inside by Antonio Citterio Patricia Viel Interiors. The hotel’s destination restaurant is Seta, by Antonio Guida— formerly of Hotel Il Pellicano, the celeberity-festooned resort in Porto Ercole, where he won two Michelin stars. At Seta, he spreads his wings a bit, reinvigorating classic Italian with dishes like fig-fed chicken breast with seaweed cream. The Mandarin’s spa is second to none, a 9,900-square foot affair with features like a dedicated Thai massage room and a hair salon led by celebrity hairstylist Massimo Serini. The Straf prides itself on a certain severity that isn’t for everyone; it was once nicknamed “Stalag Straf” in an online forum by a guest, around when it opened in 2003. The feel is akin to that of a bunker, the predominant materials split slate,burnished brass, concrete, and iron. The beds, for example, are perfect squares, designed along with the rest of the hotel by Vincenzo De Cotiis. But this is Italy, so even the authoritarianism can only be so cold. In truth, it feels more Arte Povera, with accents like a recycled Plexiglas chandelier from the 1970s. The bar is trendy, with international DJs dropping in to spin on Thursdays, and there’s live music on Tuesdays. To top it all off, the location is just half a block from the Piazza del Duomo. Like the clothing brand, you can expect a lot of masculinity from the Armani, which occupies an entire city block and opened in 2012. Every detail of the hotel was designed by Giorgio Armani himself, and it shows, from the 1930s Rationalist building that houses it, to the furnishings of the 95 rooms, to the frankincense smell in the bathrooms, to the fact that it is effortlessly stylish, despite having a color palate that doesn’t stray far from beige, gray, black, or white. Style never cedes ground to comfort, however, and there are always “lifestyle managers” on hand should your lifestyle need managing (which is often the case in Milan). There is also a 1,000-square foot spa on the upper floors that offers stunning views of the city. Below, there are shops, most of which offer Mr. Armani’s better-known design works, and a branch of Nobu, also designed by the fashion legend. Milan smolders with the vibe of all things Mediterranean. If you’re looking for something a bit more regal in the English tradition, though, you’d do well to try the Baglioni, whose main branch is located just off Hyde Park. The Milan location blends Italian style with rigorous comfort. This is embodied by its restaurant, the Baretto al Baglioni, a legendary meet-up since 1962, formerly on Via Sant’Andrea. Casual dress is not allowed. There is no Wi-Fi. The vibe is English clubhouse; the food, “Milanese light.” Don’t be surprised if you spot high-level bankers mingling with boldfaced fashion execs. The lush, high-walled garden is perfect for power brokering. Like all Baglioni hotels, the interiors—the work of the Milan-based firm Rebosio + Spagnulo—showcase a restrained flair. The work of this British industrial designer is included in the collection of the Museum of Modern Art. He happens to have a real sense for framing and scene-setting. His well-executed Instagrams are almost like still-lifes. This German designer sprinkles his excellent design and architecture photos with a healthy dose of very good art. Some designers pepper their Instagrams with jokes and personal photos, but the stellar British designer Jasper Morrison is no-nonsense. Follow for great taste and pure design objects. Nichetto is an understated, but very accessible, Venice-and Stockholm-based designer with a great eye for quirky pieces. A must-follow.